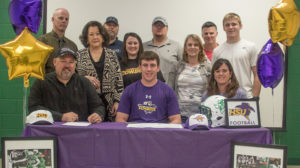 With family, coaches and friends looking on, Breckenridge High School senior Rance Russell signed a letter of intent in the Breckenridge High School Athletic Facility and Fine Arts Center’s media room Wednesday morning, Feb. 6. 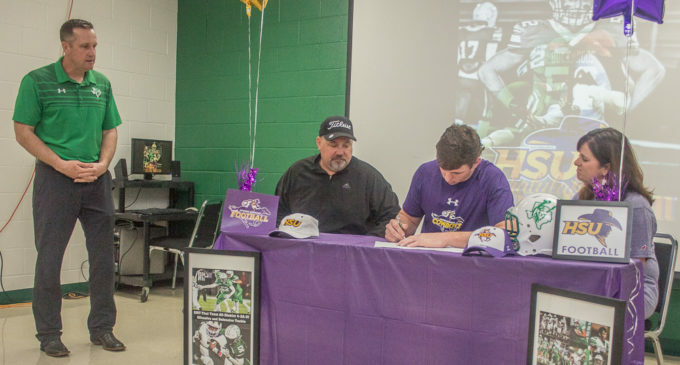 Russell agreed to play football for the Hardin-Simmons University Cowboys. The son of Tamara and Rodney Russell played both defensive and offensive positions on the 2018 Buckaroo team and was named the Defensive MVP for District 3 – 3A Division 1. Offensive Line Coach Matt Stapp said he has known Russell since Stapp’s first year as a Breckenridge teacher and coach when Russell was in the fourth grade. “It’s great to see how the journey’s progressed and where it’s at,” Stapp said.